The Barsetshire series begins with Wild Strawberries, which features Laura Morland, who has picked up her pen to write novels and support her family, after the death of her husband. She has a young son, Tony, who is off at boarding school, and although he appears in this opening novel, the story is preoccupied with various pairings and area gossip. The second volume introduces a new set of characters in the community, but this third volume features Tony, a few years older but just as mischievous. I should find Personal Demon, the eighth in Kelley Armstrong’s Otherworld series, entertaining. But I am always frustrated when a volume in this series steers away from my favouite character in the ensemble, Elena (introduced in the series’ first volume, Bitten). By now I realize that this is a temporary state; even when I have found one of the other characters lacklustre, I grow to like her as I read on. And, yet, I drag through the opening Elena-free pages until finally I accept my new heroine (this time, Hope, a half-demon), whereupon I expect I will finish the book in short order. Dorothy and the Wizard of Oz is the fourth volume in the series and the introduction addresses the fact that Baum’s readers wanted more of Dorothy. Just a couple of chapters in, I wonder whether I will find this volume more of a disappointment. And, yet, there is a horse with a sense of humour. And I am interested to see how Dorothy’s pet cat compares to the infamous Toto. I’m not sure I ever finished reading this volume as a girl, as it’s one of the more pristine volumes in my set of Del Rey paperbacks (it is peeking into the bottom of the photograph, with a yarn-tasselled bookmark, dating from the same era). I’m keen to read on (some later volumes were obviously well loved, especially The Emerald City of Oz) and see whether there are new favourites to discover here. 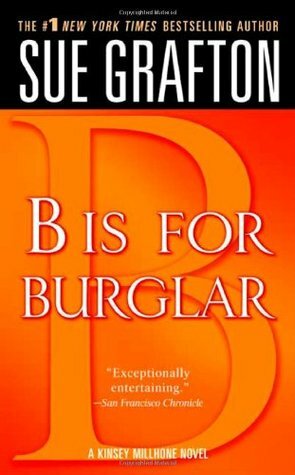 Like the Oz books, I’ve previously read some of the books in Sue Grafton’s alphabet series. In fact, about half of them. They were amongst the first mysteries I read upon discovering the genre (with P.D. James and Diane Mott Davidson, Ellis Peters and Patricia Cornwell). Rereading ‘A’ last month, I was surprised to find the style so bare-bones, because I remembered Kinsey being fiery and gutsy, not cool and orderly. The novels present information as an extension of her typed reports regarding her method of solving cases, however, which explains the distanced and evaluative tone. And, yet, the narrative also includes some scenes which clearly would not be included in these notes, so the reader can observe more intimate and personal dynamics of her character. When I first met Kinsey Millhone, libraries were not computerized to allow patrons to request specific titles, and I had searched the books-returned carts unsuccessfully for ‘A’ and ‘B’ for weeks and stumbled into ‘C’ ahead of time, so this will be the first time that I meet Kinsey in order. Even though I now prefer mysteries with a little more substance and complexity (not necessarily in terms of plot, but character and theme), it’s a pleasure to rediscover some of the elements so fondly remembered, like her emergency little-black-dress and her charming landlord, Henry, still baking bread all these years later. As a girl, I never read beyond the second volume of Madeleine L’Engle’s Time series. And even after finishing and enjoying the third as an adult, I have struggled with Many Waters. Once again, this might come down to stubbornness. I know that the twins, Sandy and Denys, should be as interesting as Meg (and eventually I made room in my reader’s heart for Charles Wallace). Should be. But then they appear in some unrecognizable time and place and I feel even further away from my love of A Wrinkle in Time. Just last year I abandoned this volume once again, about 80 pages in. Now, I’m not entirely sure why. After all, beyond Sandy and Denys, the concept of home and belonging is clearly at the heart of this story: that certainly appeals. And there are unicorns here, in this hot and dusty place, unicorns whose appearance is suspiciously oasis-y but are recognized as real by the inhabitants of these strange time and place. What more should I require. 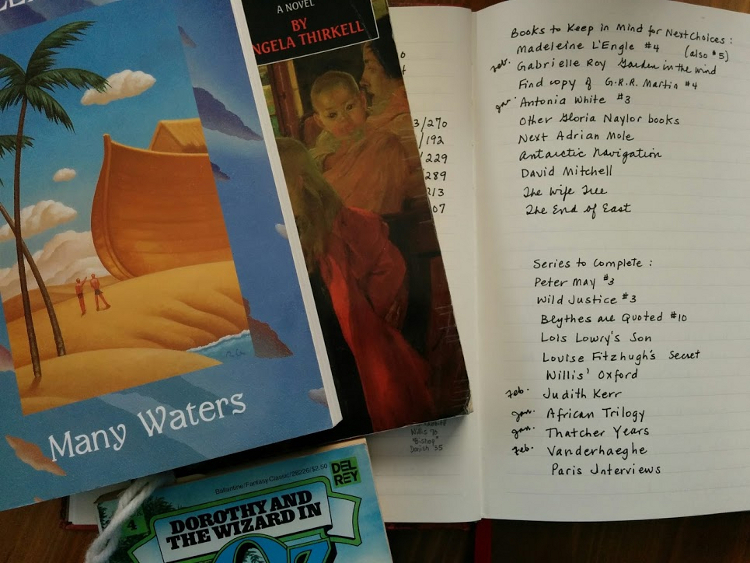 Does talk of your series reading require a separate page in your notebook? Do you get overly attached to characters? Are there chunks of books on your shelves that you have collected and neglected? Have you been rereading old favourites (or un-favourites) this year? So far this year, I have enjoyed a comforting re-read of Agatha Raisin and the Quiche of Death by M C Beaton, from Beaton’s long-running cosy crime series. I am hoping to make time for more old favourites soon. I’ve only read one M.C. Beaton novel, and I don’t remember anything at all. Quite likely I read it out of order (it was around the same time that I first ‘discovered’ the Sue Grafton mysteries actually) and didn’t properly appreciate it becuase I wasn’t properly introduced to the character. Good luck making time to reread some old faves! I think I have said before that I tend to avoid series. With the exception, of course, of Anne and Emily. Even when I tried reading The Hunger Games and Divergent with my daughter, I only read the first of both of those series, because I just didn’t want to invest anymore time in them. Luckily, I had her to fill me in, but I wasn’t even very curious. I’ve only read A Wrinkle In Time. At the time, I didn’t even know there were more. The Sweetness At the Bottom of the Pie appeals to me, and I have been picking those books up at sales as I find them, but I’m reluctant to read them because I know they are a series. My mother bought me The Game of Thrones series, but I haven’t touched them. I have heard Angela Thirkell’s books are good – I didn’t know they were a series. Maybe not all of them are. I haven’t ever seen her books around here. My oldest daughter also loves all the series! She can’t get enough. Yes, I read ‘Son’ also. It brings everything full circle. I think you would like it! Whenever she has brought one home, I’ve eyed it, and she’s always declared they’re amazing, but at a certain point it began to seem impossible. I suppose because I have so many series unfinished on my own shelves. I saw a nice new copy of Son at the library the last time I was in; now I’ll have to take another look. See, you always encourage my “library practice”. Heh.